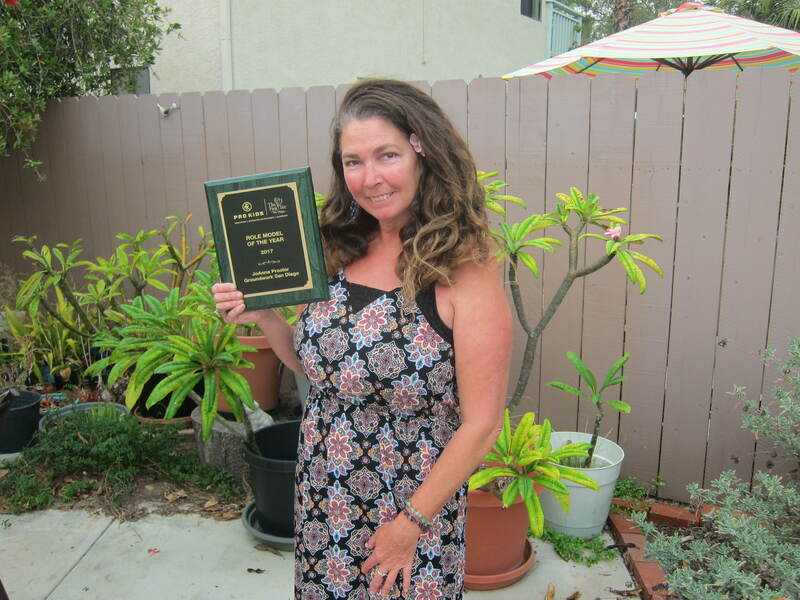 If you are a resident of San Diego, there are all sorts of rebates out there that can help you save money on your bills, and also help you conserve water and energy. Through our EcoVillage program, we offered upgrades like Rainwater Harvesting Barrels, and Laundry-to-landscape systems free of charge for residents within our project area, but you can still access these technologies and much more at discounted prices by taking advantage of the rebates and savings offered by the City of San Diego, SDG&E, SoCal WaterSmart, and the Center for Sustainable Energy. In these articles we’ll run you through the rebates and discounts you can get, and some information regarding each one. 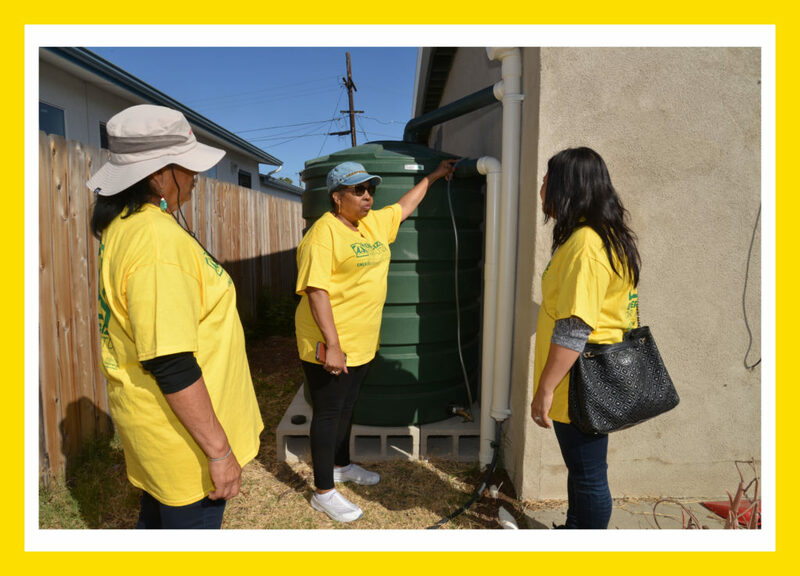 The first set of rebates we’ll get into are for products that you can install in your home that can cut down on your water usage, saving you some money on your bill and contributing to conserving water in our drought-prone region. It’s safe to say that toilet flushing is a daily operation, and something that is hard to imagine life without. Toilet flushing on average accounts for 30% of total in-home water use, so while we won’t make any arguments for removing toilets altogether to conserve water, it’s worth looking at these newer, more efficient toilets that can make a big difference. By installing a high efficiency toilet in your home you can save over $800 over the lifetime of the product. The rebate is for $40 back per toilet. Based on the list of qualifying model you can get a high-efficiency toilet that uses less than 1.1 gallons per flush for around $300. Doing laundry amounts to about 15% of the average residential water usage. Cutting down on the amount of water and energy going into your laundry routine can save you $400 over the washer’s lifespan. There are actually two separate rebates that you can use in conjunction to save on your purchase of a high efficiency clothes washer. SDG&E also offers rebates for both Electric and Gas water heaters. To find out which model will be best for you, check out this comprehensive infographic by the Department of Energy. Like the infographic mentions, heating up your water takes up 14-18% of your household energy use, so finding the one that is right for you will be crucial. There are plenty of other points in the home where you can save a lot of water over the course of a year. One source of water waste, and something that could be damaging your plumbing system, is at the point where the water enters your homes pipes. The water pressure coming into your home might be too high, which can cause leaky pipes and those wretched noises that haunt every turn of the knobs. By Installing Pressure Reducing Valve (PRV) you can lower the pressure, and save an average of 30,000-40,000 gallons of water per year. This one doesn’t count as a rebate, but it’s a great (and free) way to find out other ways to make your home more efficient. 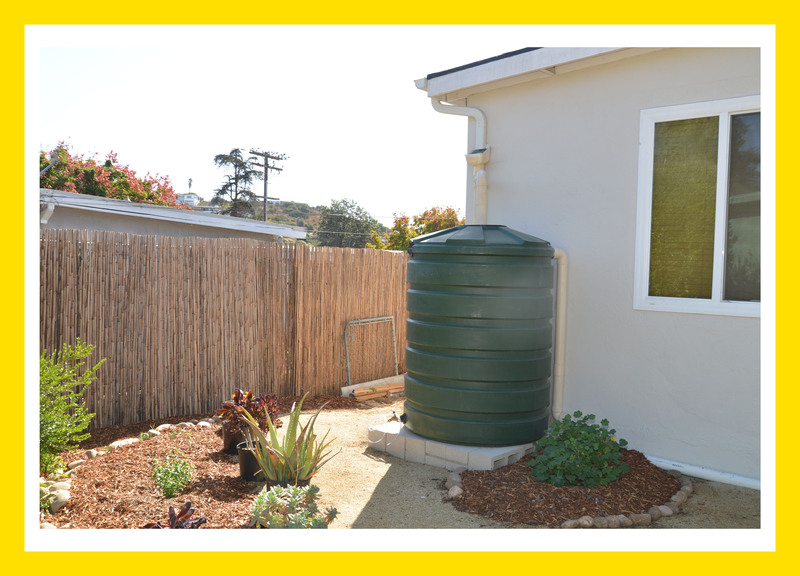 You will receive a free evaluation of your water usage by an expert, recommending you ways to save money and water in your home. Sign up for that here: Socal Water$mart Checkup. 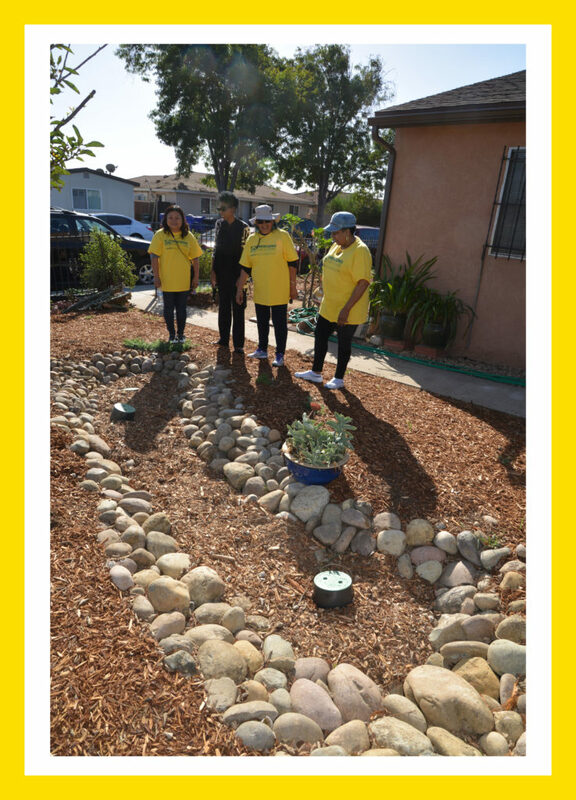 Socal Water$mart also has this great list of tips for conserving water, which can help you begin thinking about ways to upgrade your daily routines, or to bring home some new technologies to contribute to our regional water conservation efforts. With all these technologies and tips combined, you could be saving hundreds of dollars and tens of thousands of gallons every year. 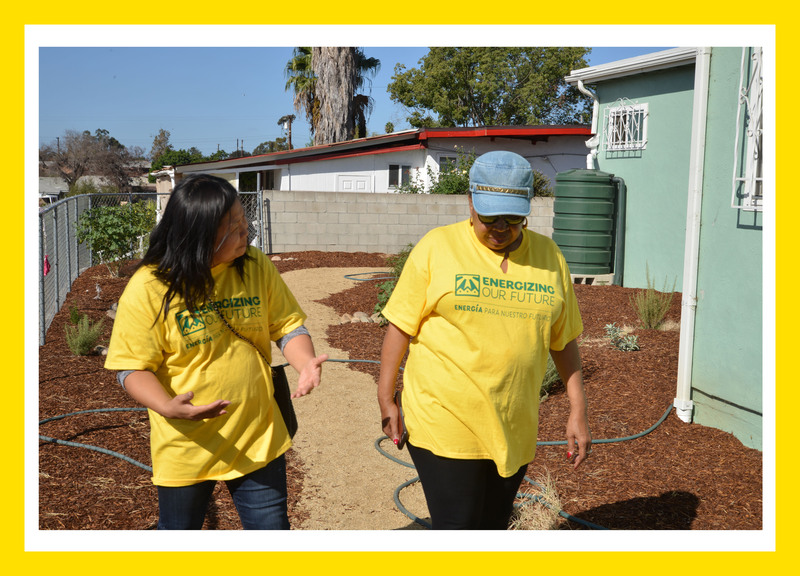 That wraps up the indoor water rebates and conservation resources that we found, and if you happen to know of anything we missed, send an email to ali@groundworksandiego.org and we’ll begin spreading the word. Stay tuned for next month’s newsletter for more rebate information! 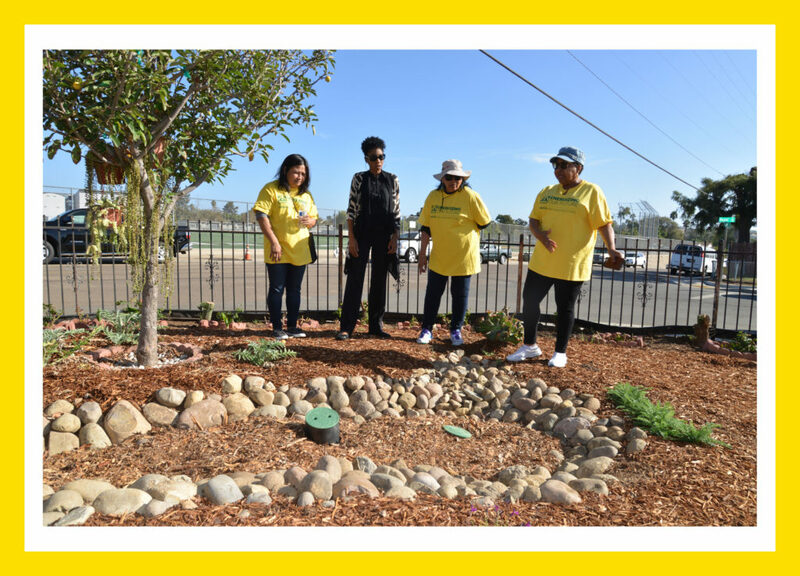 Groundwork San Diego, working with local San Diego partners including City Council President Myrtle Cole, County Supervisor Ron Roberts, and a team of local consultants, has completed the construction phase of a mosquito control project in the Encanto neighborhood. 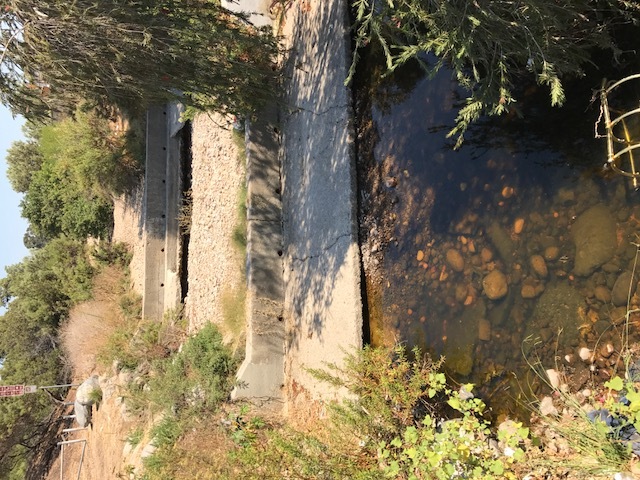 The project was designed to remove pools that had formed in Chollas Creek just north of the Lenox Drive Bridge due to deteriorated grade control structures. 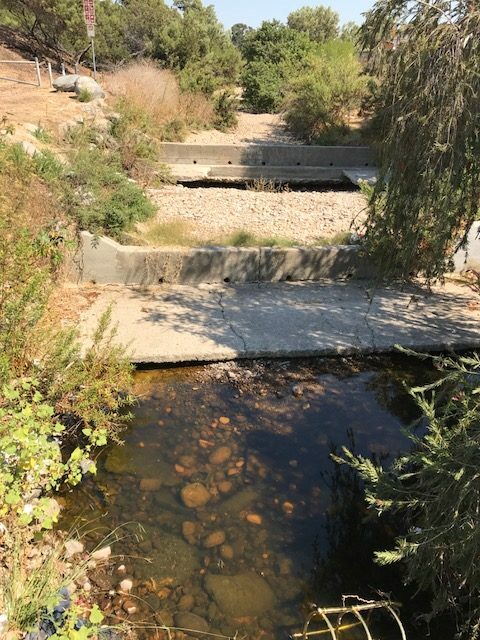 The County of San Diego had identified the site as a high priority treatment area, due to the potential for mosquitos to breed in the pools. 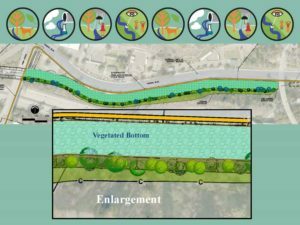 The project includes removing the concrete structures, re-grading the creek channel to allow water to flow through, and planting native vegetation along the creek banks. 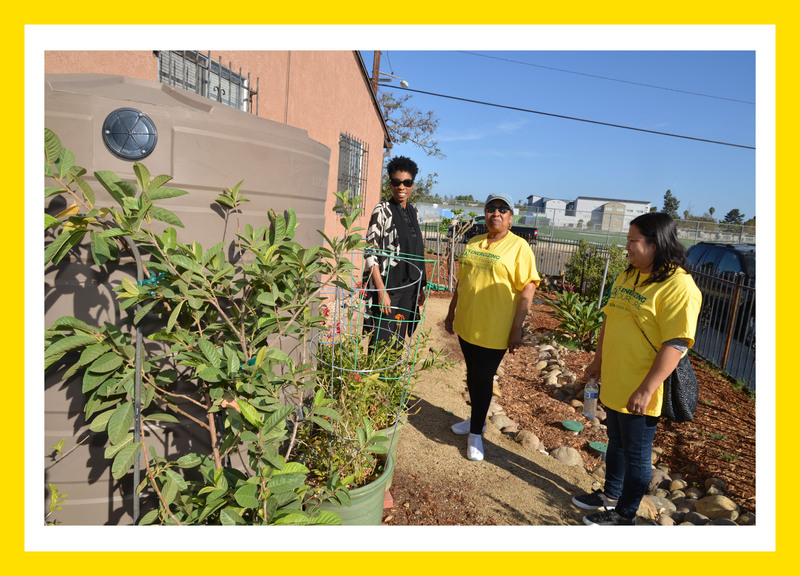 The work is being funded by a competitive grant that was awarded to Groundwork San Diego by the County of San Diego Department of Environmental Health under the Vector Habitat Remediation Program, part of the County’s Vector Control Program. 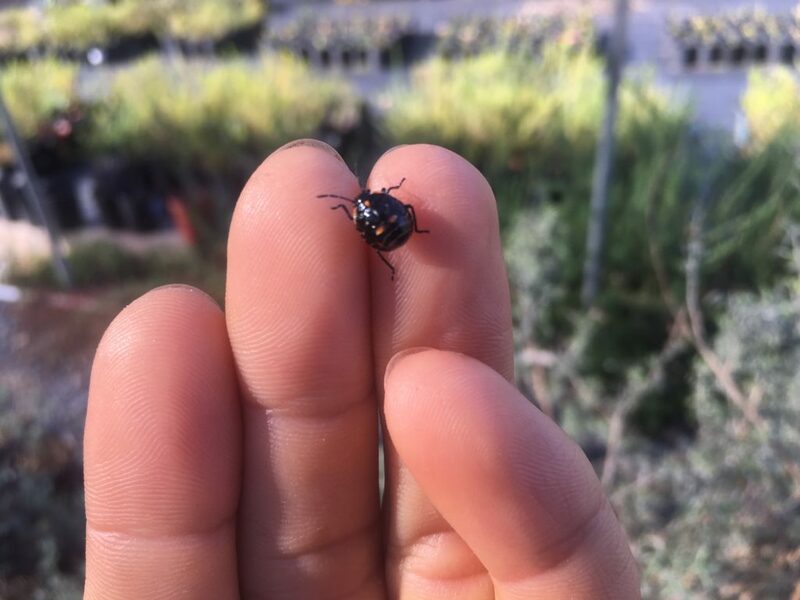 The San Diego County Vector Control Program is a countywide effort that monitors vectors and the diseases they carry. A “vector” is an animal or insect that can transmit a human disease. The Vector Control Program works to protect public health by surveying for diseases carried by vectors, responding to public requests for vector inspections, and educating the public about mosquitoes and other vectors. 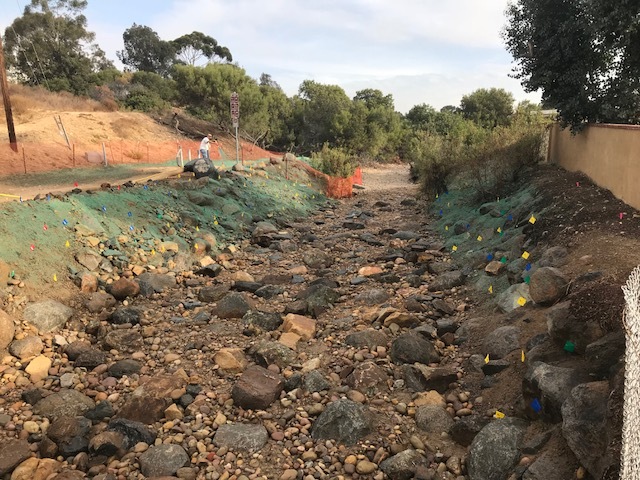 Photo 2: Upstream of Lenox Drive bridge on November 29, 2017 after construction. 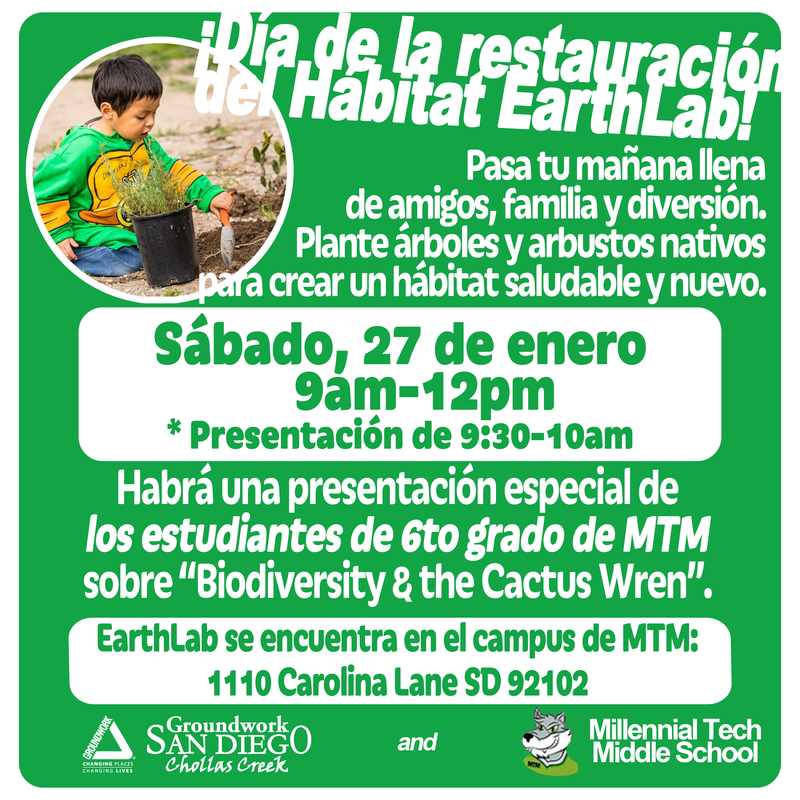 EarthLab Soon to be Encanto Gateway! After years of collaboration with CalTrans and the City of San Diego, and the help of our community’s strong and effective voice, Groundwork is pleased to announce that the dangerous Euclid South SR 94 offramp will soon undergo a major transformation. 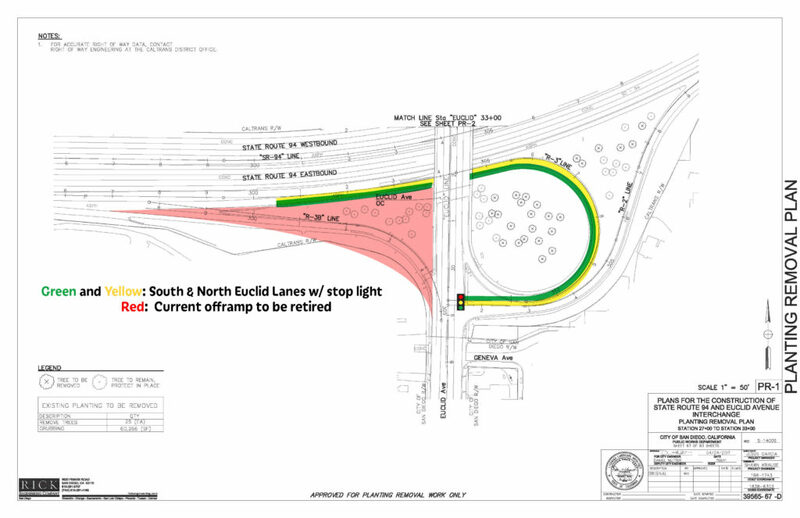 Modeled after the Massachusetts Ave SR 94 offramp down the road, Euclid South offramp will become a cloverleaf onto Euclid Ave. At the new stop light at Euclid and the offramp, drivers will be able to safely and easily travel north or south onto Euclid. 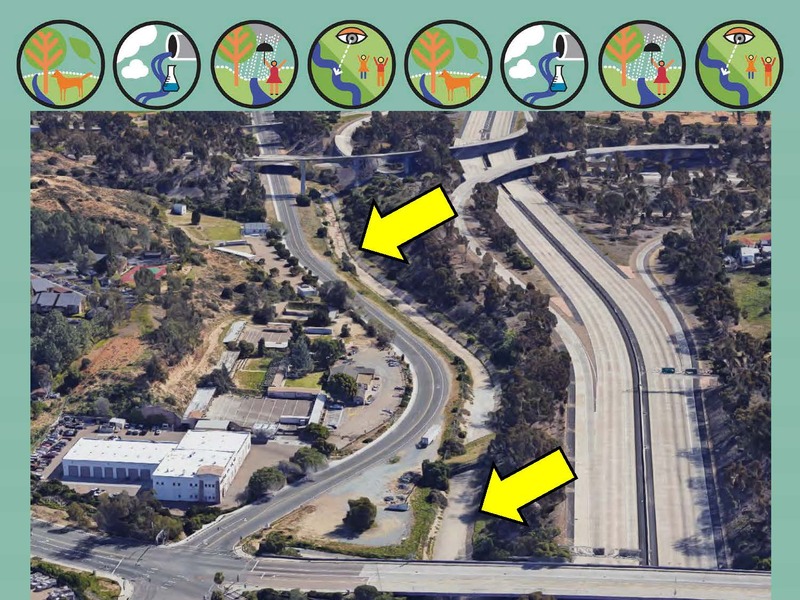 And the very first thing drivers will see at that stoplight is our EarthLab, our ever-improving community garden and youth and family climate action center. Heeeelllllllllooooooo everyone! Alex here, checking in from EarthLab! Not many interesting things happened at EarthLab this month but still managed to find a few things to share with you all. So, let’s jump right into it…………. I can’t quite recollect if I have shared any pictures of the many fungi that appear throughout EarthLab. But, just in case I haven’t, here are a few. 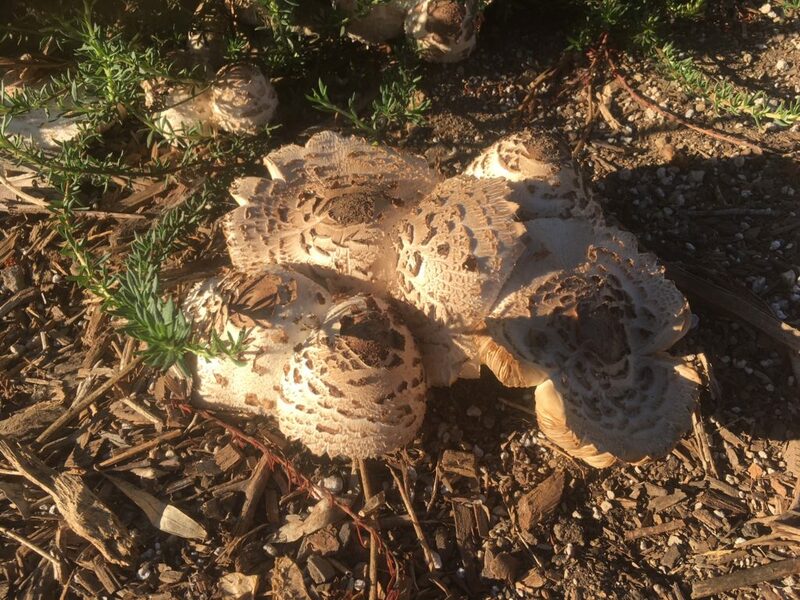 This one, I found growing on a tree trunk of a cut down tree. It had a very foamy appearance to it with a white and yellow gradient on it. 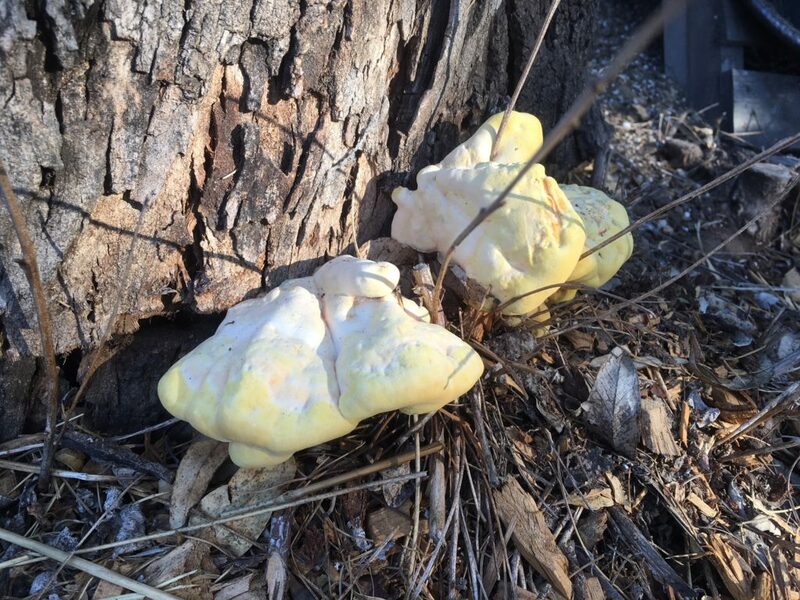 I kept coming back to check on the evolution of this fungus and everyday the yellow on its edge became darker and more pronounced. After a few days the smooth transition of its gradient from white to yellow had changed. It had become a darker tone of yellow with more defined edges. It almost looked like it had a ring similar to the rings of Saturn! Unfortunately, I did not get to capture this amazing transformation of its later stage but I do have a picture of its initial look. When the plants we have on pots at EarthLab don’t make it, we empty the soil onto a pile for later use. There has been quite a few times when we start to see plants grow from this mount of soil. Here we have some buckwheat and a few mushrooms. Check out the pretty cool looking texture on its surface!! Moving on to some critter images. Ever heard of Peritoma arborea? 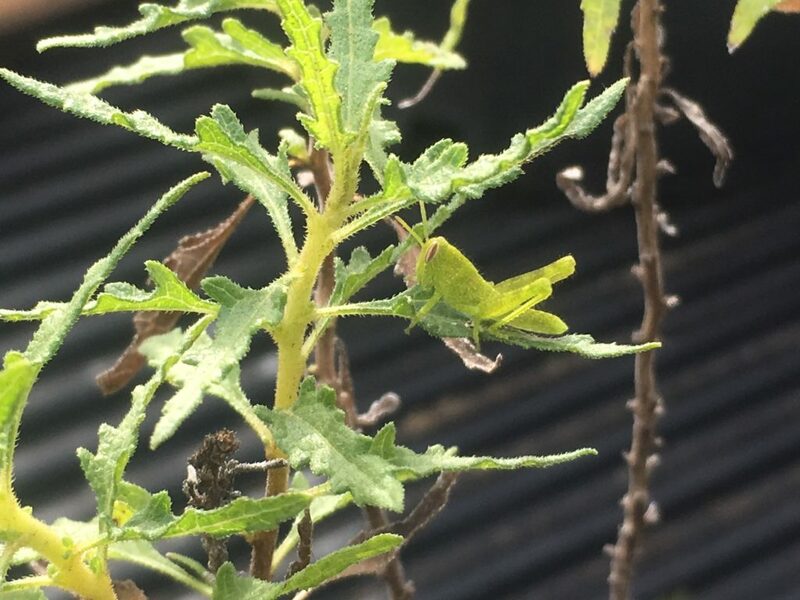 What about its most common name, bladderpod? Well then, let me inform you a bit! 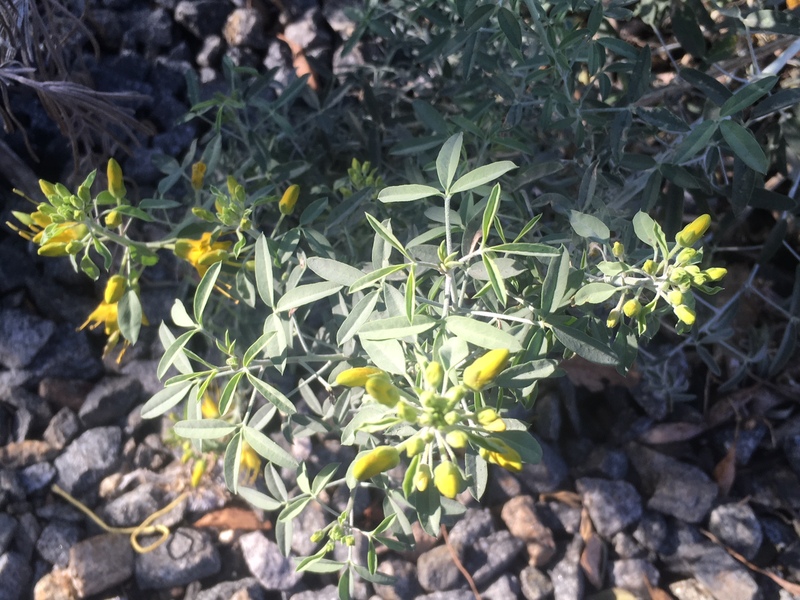 Bladderpod is a perennial shrub. Perennial meaning that it grows and blooms over the spring and summer, and dies back every autumn and winter. 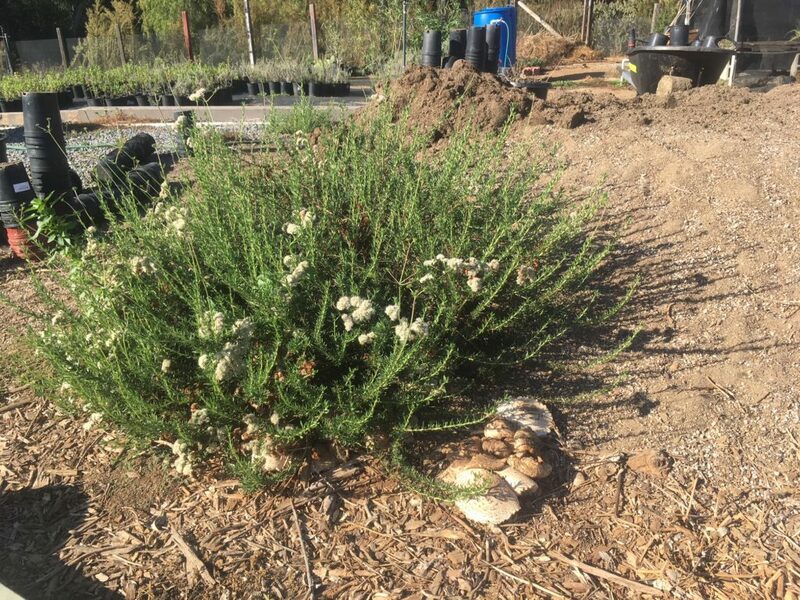 This plant has a foul smelling odor from chemicals it produces to discourage insects from eating it. However, that doesn’t stop these critters from hanging around! 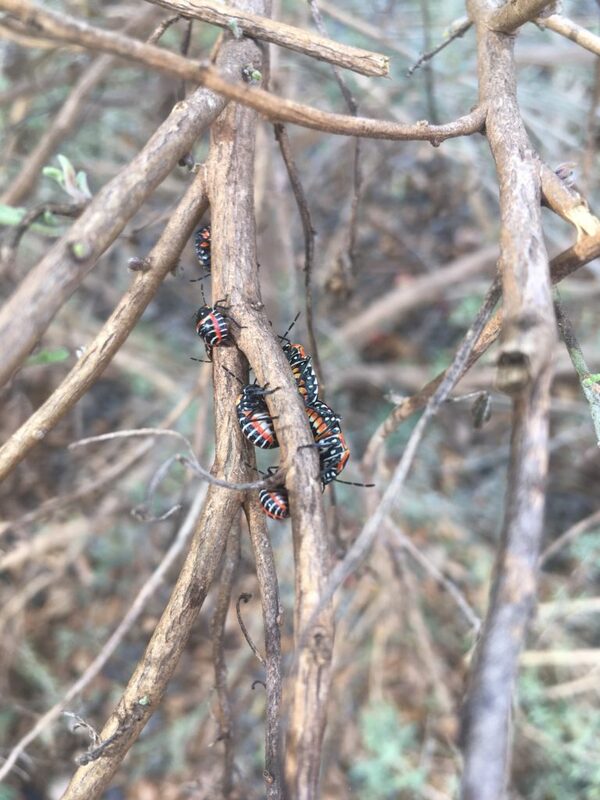 These are known as Harlequin bugs. Not to confuse them for the Batman character Harley Quinn! 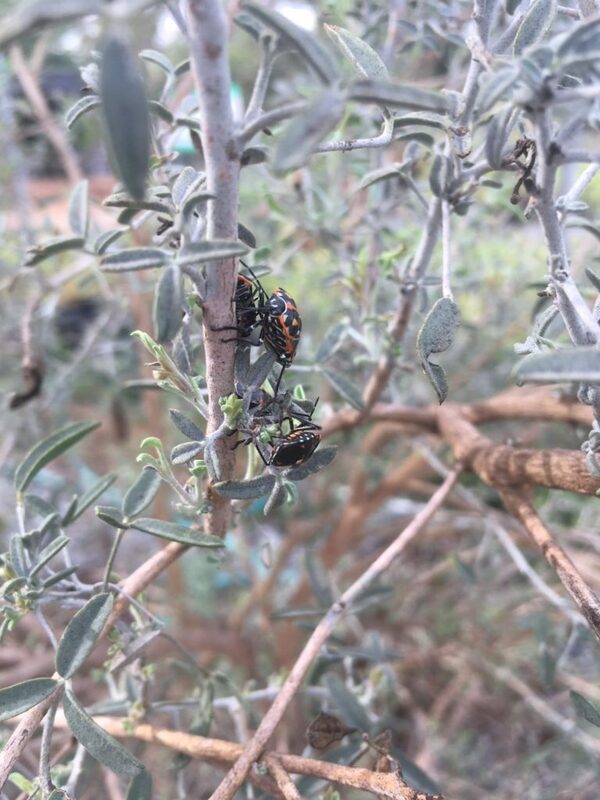 Not sure what the reason is but these harmless bugs LOVE these shrubs! I guarantee you that you will find more than 30 at any given moment! 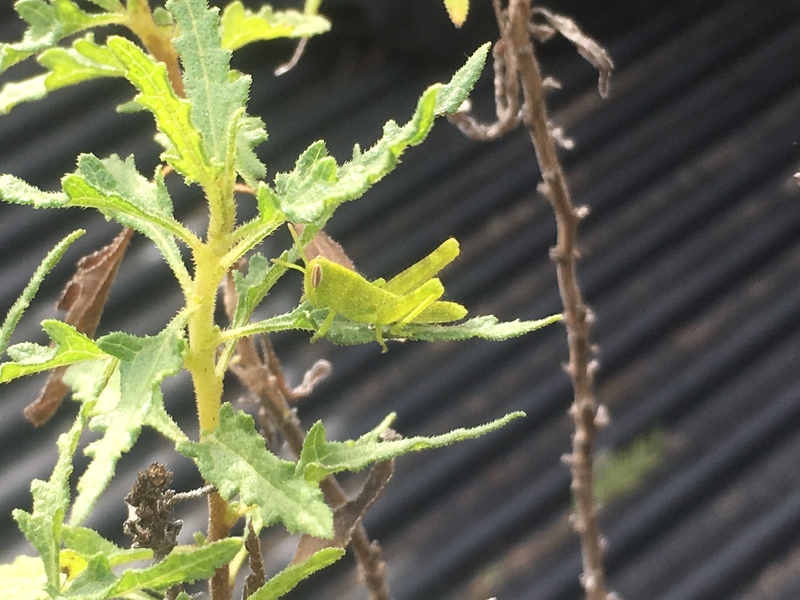 Moving on to our next critter, we have this finger nail size grasshopper. Such a cute little critter. Can’t say the same for the bigger ones. I’m just not too fond of their bigger counterpart. Well, that’s it for today! 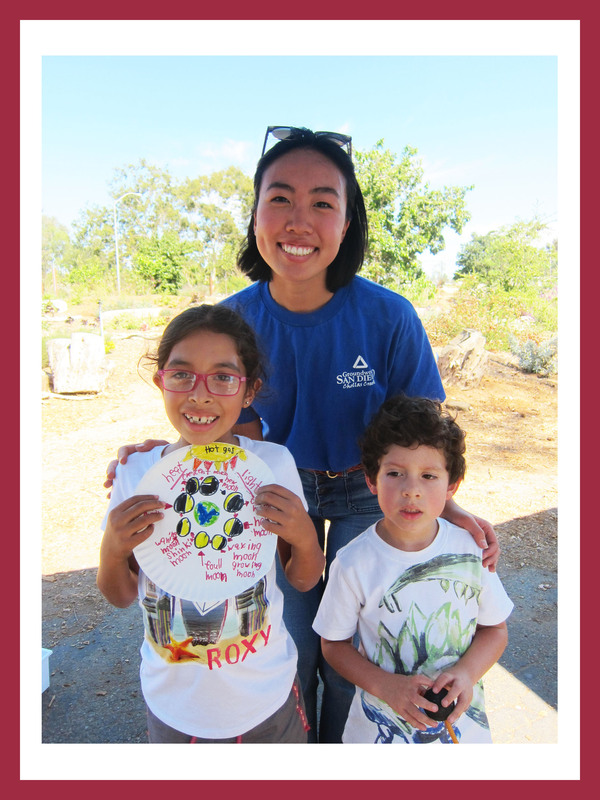 Come check in next month for more EarthLab fun! October was an amazing month, filled with a variety of stimulating, interactive activities for our Lincoln Cluster students. 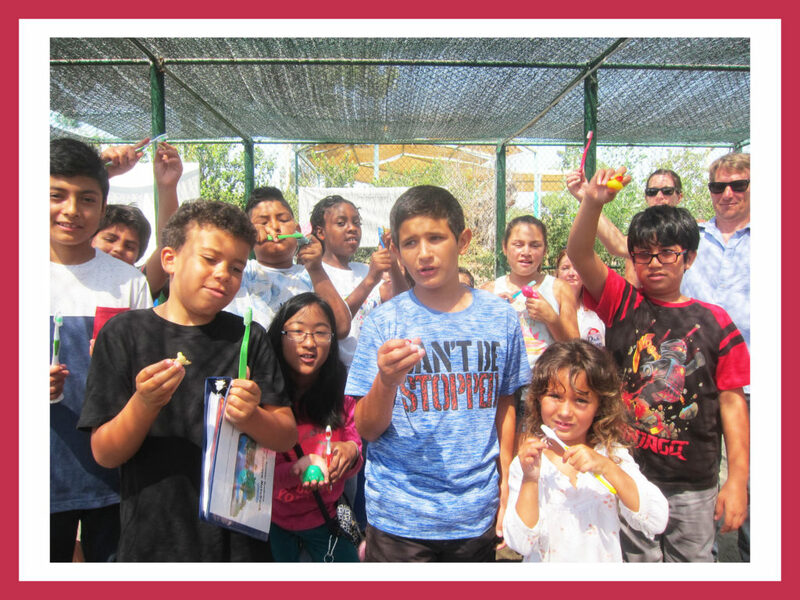 Webster, Chollas-Meade and Johnson elementary schools participated in our Elementary Science Star program. Topics included Astronomy, Geology and Hydrology. MTM 6th grade science students are currently participating in our new Water Quality & Conservation program. Other MTM 6th grade historians learned how to make Stone Age tools and shelters. EarthLab was proud to host an incredible community service day with 100 Navy personnel and 120 MTM students for Fleet Week. We planted a brand new 40 tree orchard. It is gorgeous! 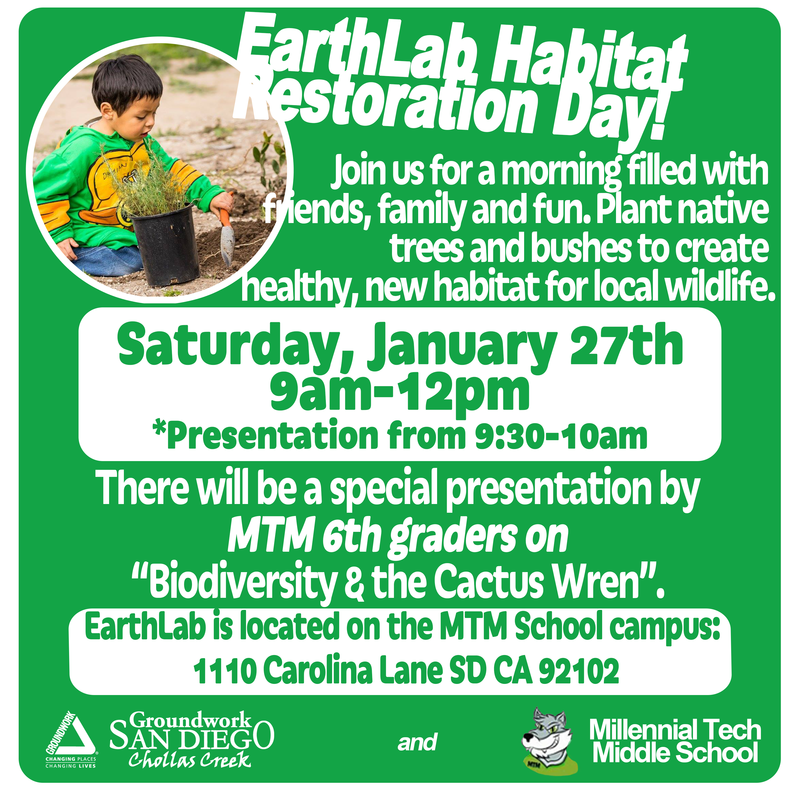 One of our finest accomplishments is the implementation of our new Saturday EarthLab Club: Science & Service. 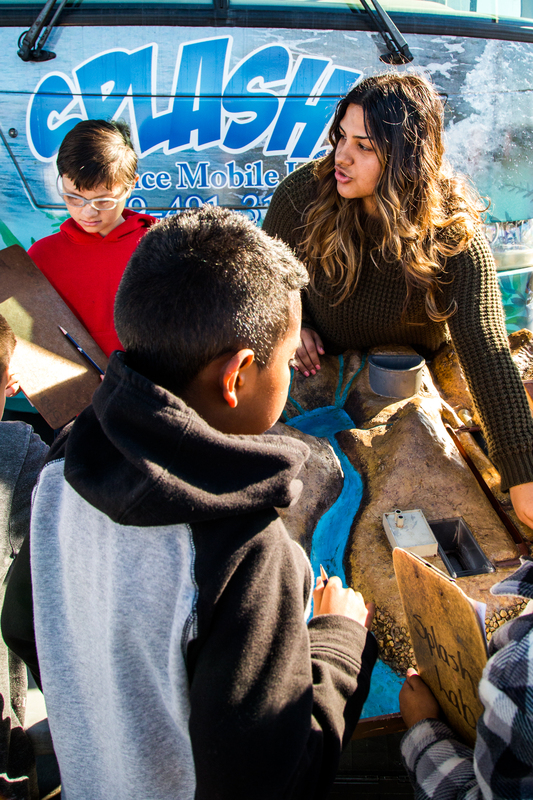 The community is welcome to join us each Saturday from 9:30-11:30am to learn experimental, exploratory science which is interactive, educational and stimulating. We are also proud to announce a new partnership with Malcolm X library, which provides a monthly literacy activity for preschoolers outside at the EarthLab. The first Tuesday of each month, 10-11am, families are invited to bring their little ones to the EarthLab for Sunshine Story Time. 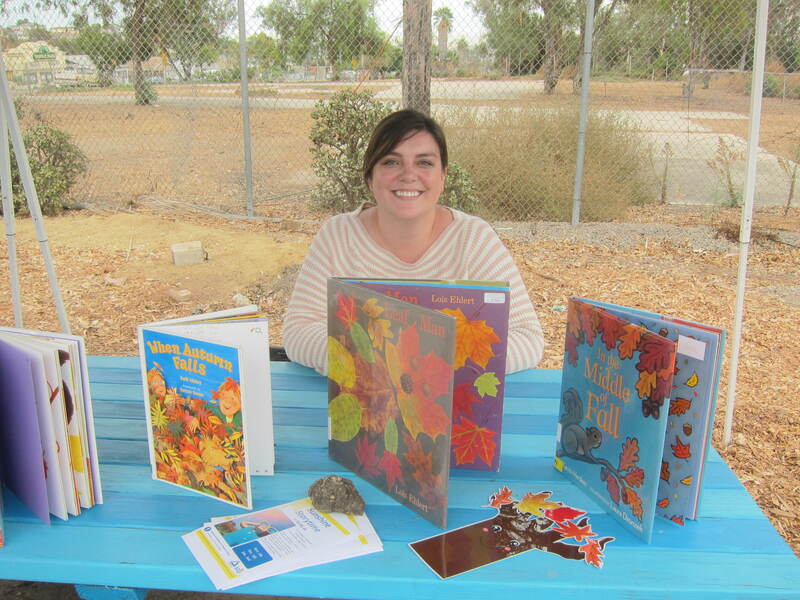 Activities will include a story and interactive arts & crafts surrounding nature topics. There is always so much to learn at the EarthLab and we appreciate all of the support and collaboration the community shows us. We look forward to another busy month ahead of us. To borrow from the proverb that “it takes a village…”, in this case it literally will take everyone in our Chollas Creek Ecovillage to create a Net Zero Energy (ZNE) community. This will require residents and commercial businesses alike to create and adopt a lasting culture of climate action needed implement our goals. 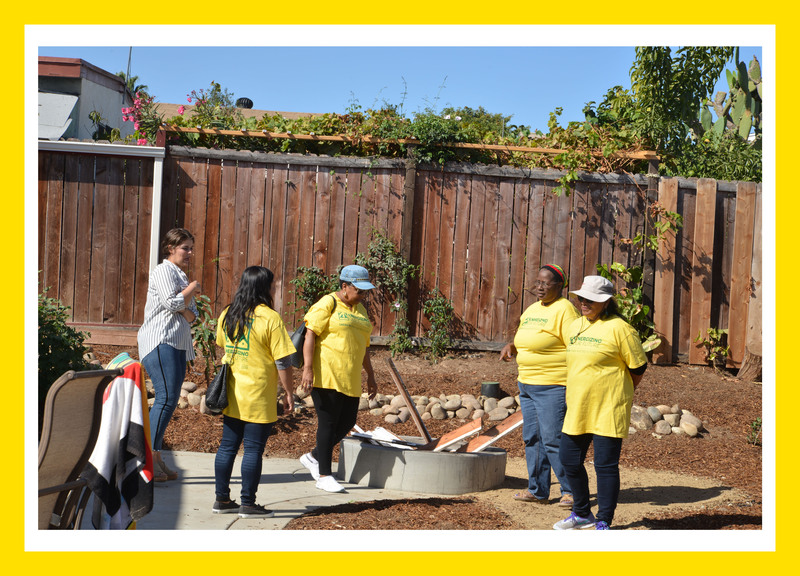 Groundwork San Diego has already started engaging community residents helping them implement sustainable energy and water strategies. Now the time has come to engage our commercial businesses, so that they can participate in our Ecovillage. 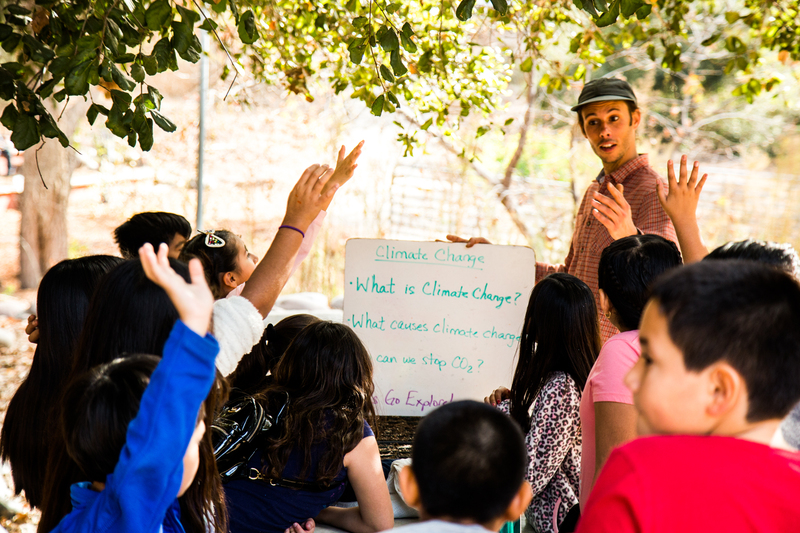 Commercial businesses within the Chollas Creek Ecovillage are important stakeholders due to the fact that they use approximately 41% of the electricity delivered to our area. Without significant participation from these commercial businesses, our ZNE goal will be not be possible. 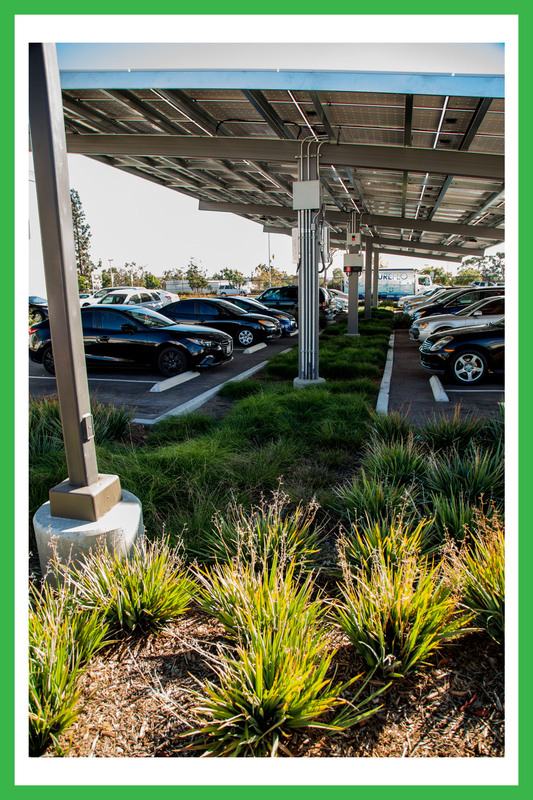 To that end, we at Groundwork have launched a campaign to educate and collaborate with commercial entities to promote implementing energy efficiency upgrades, driving electric vehicles, and switching to renewable energy sources. 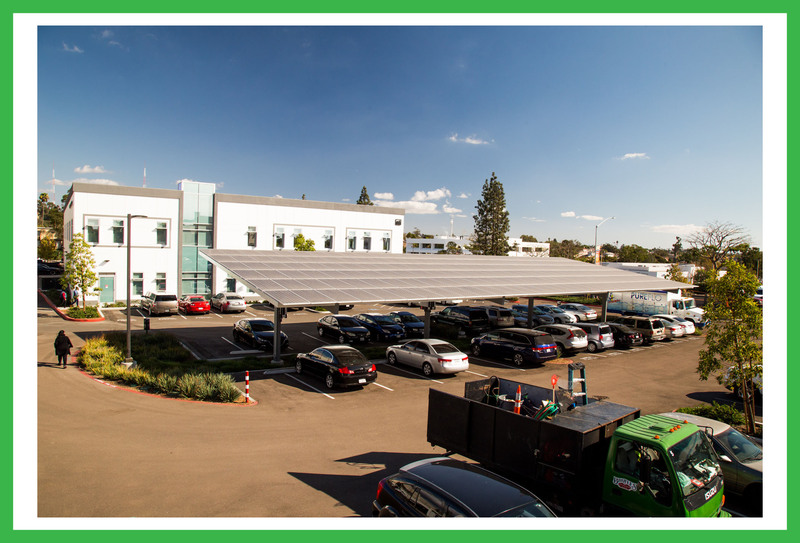 To make our ZNE community a reality, a key step is to make sure our commercial building stock is as energy efficient as possible and being powered by renewable energy sources. Many of these buildings were built years ago, and as a result are not as energy efficient as they can be. 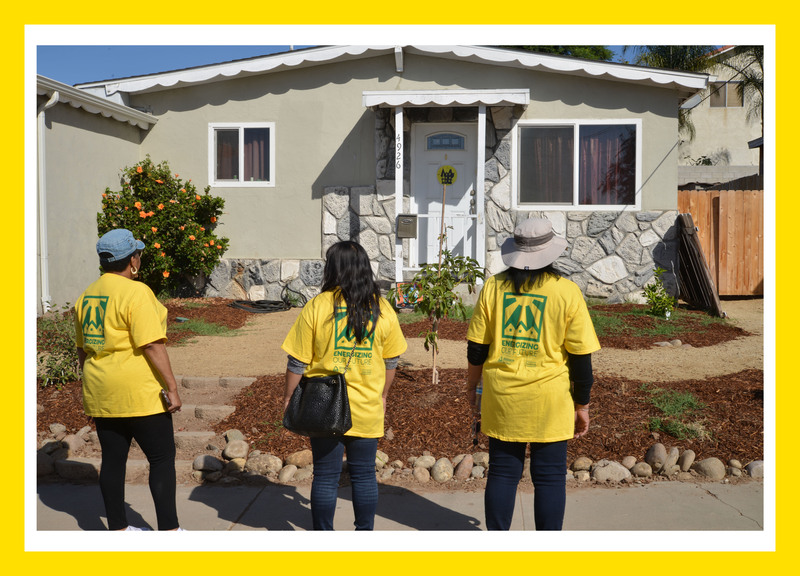 Working with our partners, we hope to show Chollas Creek businesses ways to retrofit their buildings without impacting their bottom line. Actually, our goal is to energize their bottom line since being energy efficient and using renewable energy will save these businesses money. Imagine an Ecovillage where the free rooftop spaces of our supermarkets, doctor offices, and industrial buildings are covered with solar panels, providing clean renewable energy to energy efficient buildings and fleets of electric vehicles. Thankfully there are many local and State incentives that can assist with the financial demands of these critical retrofits. Groundwork’s commercial outreach includes educating commercial businesses what these financial incentives are and how they can take advantage of them. We will be there every step of the way assisting our commercial stakeholders through this process. However, we are not limiting our outreach to just energy. 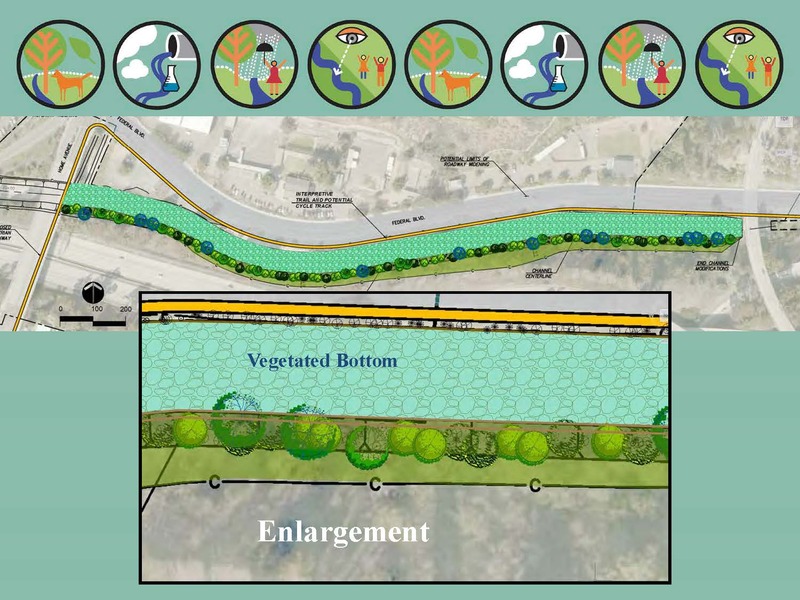 Storm water capture, potable water use and conservation will also be an integral piece of our message. It is critical that the water-energy nexus be understood if our community is truly to become an Ecovillage. There is lots of work to be done, but we are confident our village is up to the task. 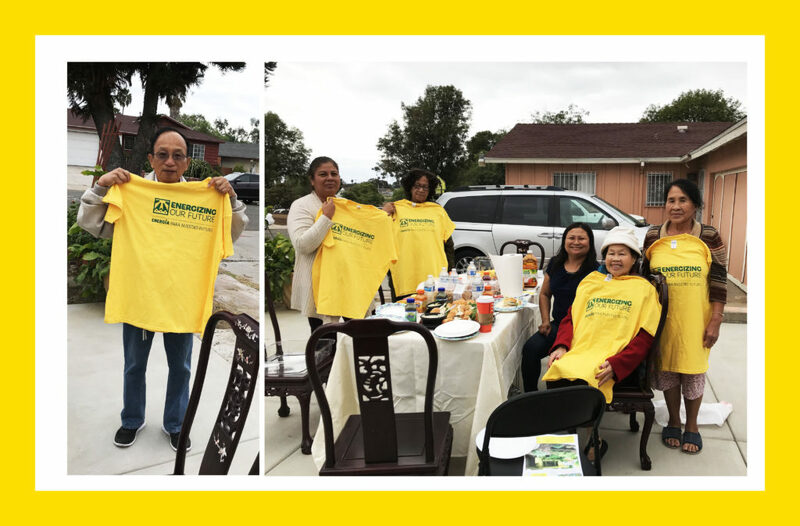 What a wonderful time we had when Neighbors joined Neighbors at the home of Stacy Sibownhewang for a presentation on the Chollas Eco Village Home Makeover Project. 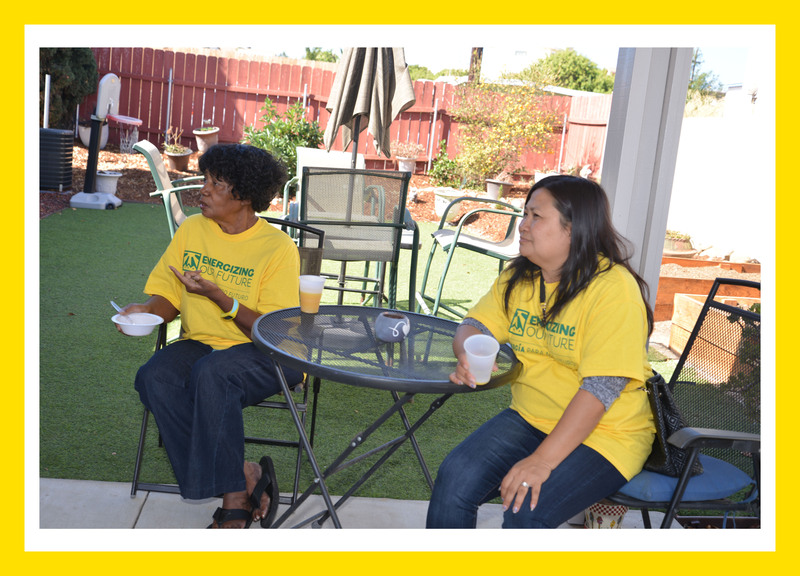 All neighbors in attendance signed up to receive a home makeover, received a t-shirt and enjoyed the refreshments. About a week before, we had another Waking Tour Celebration around the block. 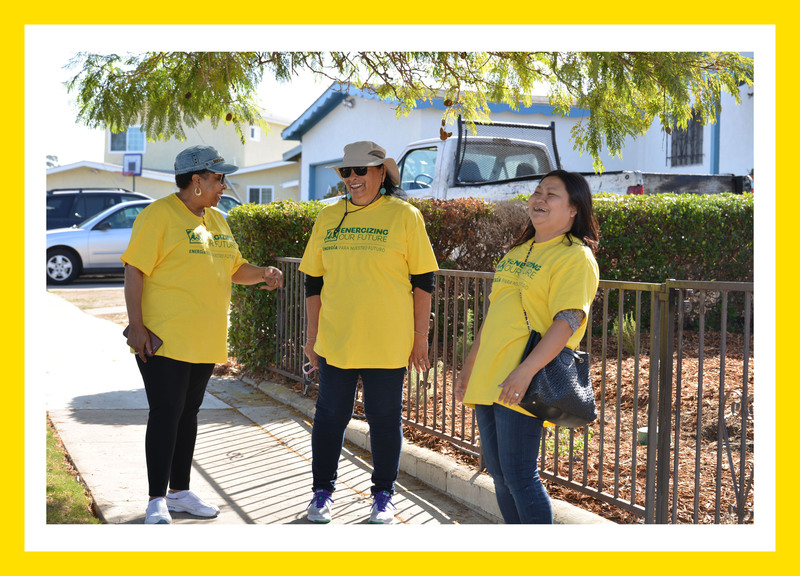 Our Neighbors Joining Neighbors Walking Tour Celebration took us from 752 Escuela Street to 5002 Lakiba Palmer. 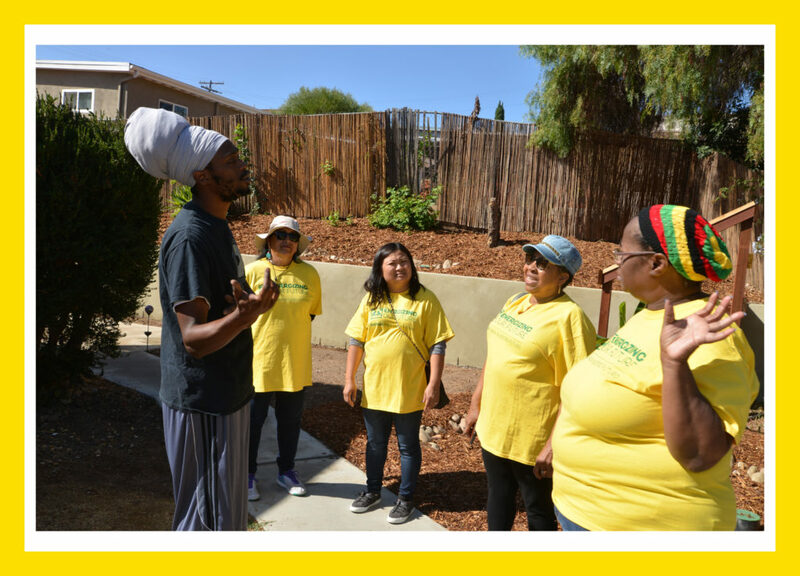 We were excited to have Monica Montgomery, Community Leader, join us as we toured the completed homes and met residents along the way. 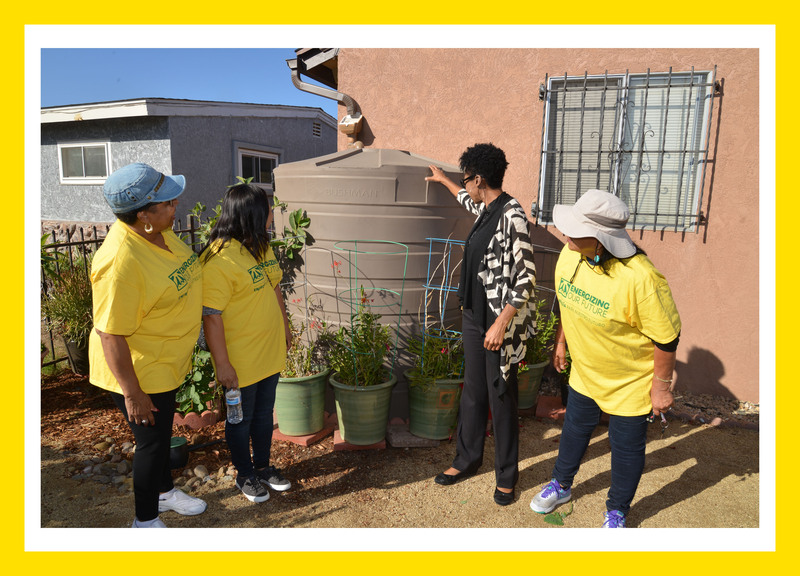 One of the highlights was seeing the 865 gallon rain barrel installed on Hilltop and Duval. 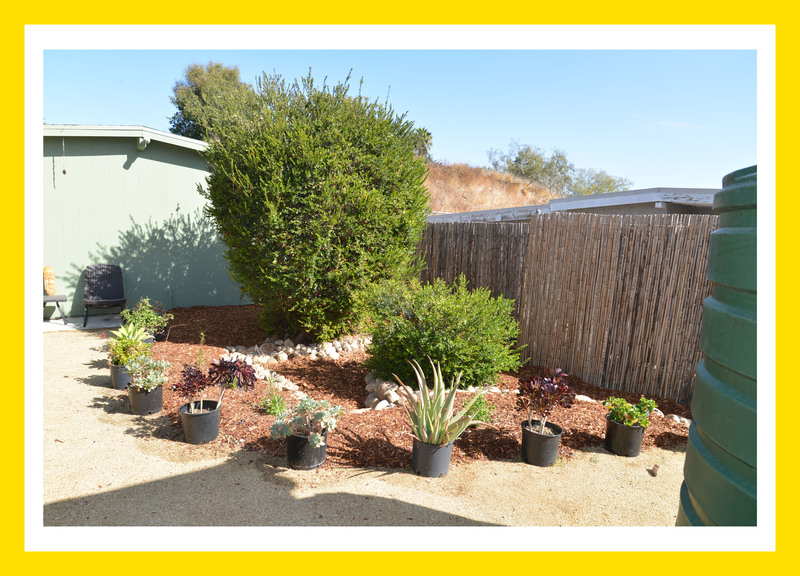 We were also joined by a resident who wanted to see examples of yards after being transformed with drought tolerate plants, trees and landscapes. 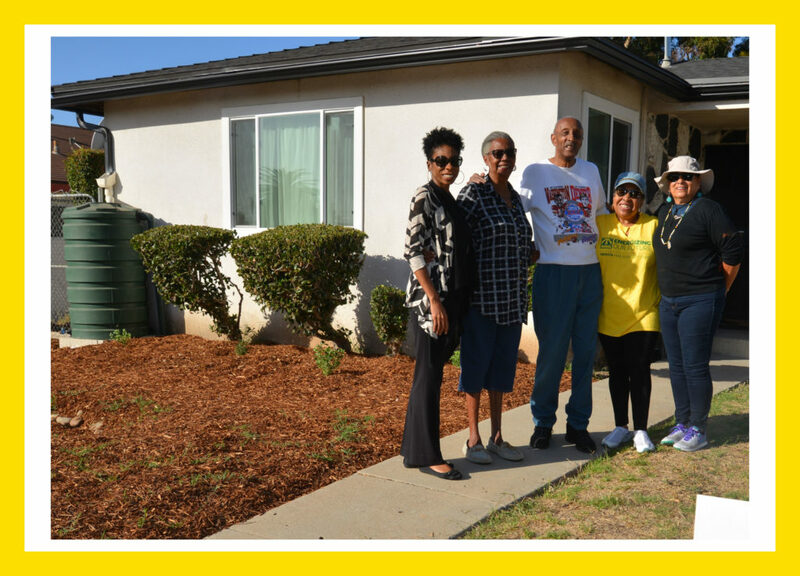 Residents who had received the home makeover welcomed us into their yard, and shared their enthusiasm about the home and landscape upgrades they have received. 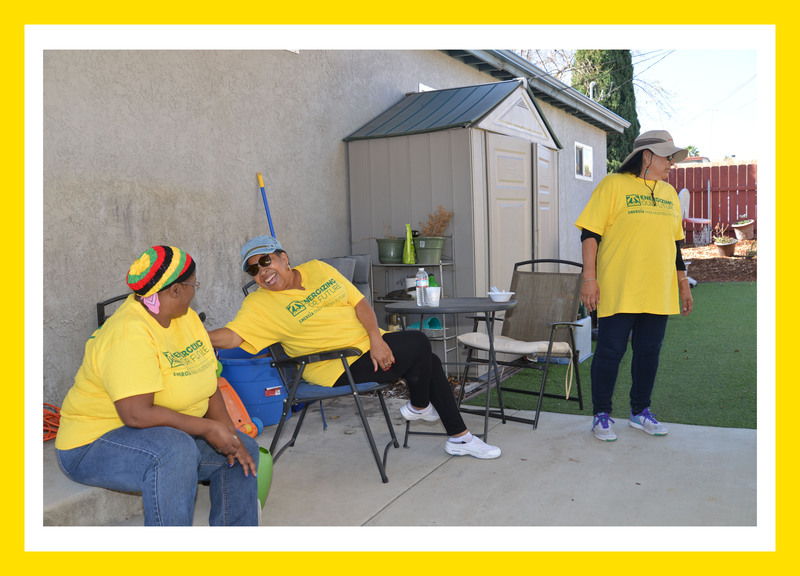 Our celebration walk ended at 5002 Lakiba Palmer – with laughter, some refreshments, and community fellowship. 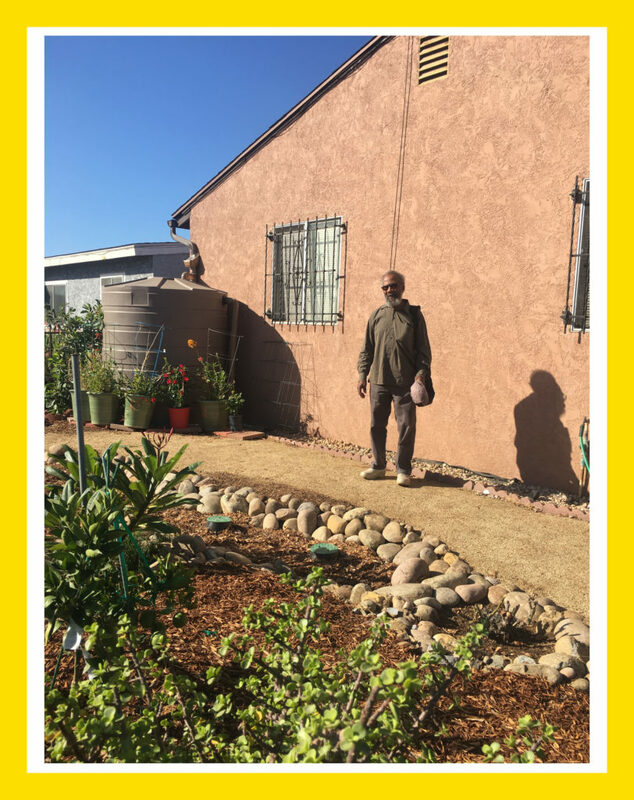 Photographs were taken (and generously donated) by the owner of the 865 rain barrel, Mr. Charles Gay (pictured above).